Do you know how memory is allocated for structure members in C? You can learn below concepts of C in this topic. how structure members are stored in memory? How to avoid structure padding? 1. How structure members are stored in memory? Always, contiguous(adjacent) memory locations are used to store structure members in memory. Consider below example to understand how memory is allocated for structures. There are 5 members declared for structure in above program. In 32 bit compiler, 4 bytes of memory is occupied by int datatype. 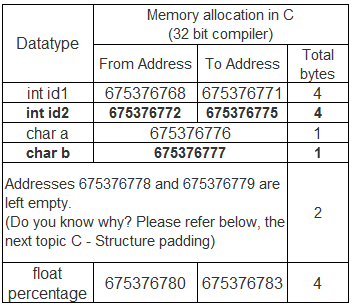 1 byte of memory is occupied by char datatype and 4 bytes of memory is occupied by float datatype. Please refer below table to know from where to where memory is allocated for each datatype in contiguous (adjacent) location in memory. The pictorial representation of above structure memory allocation is given below. This diagram will help you to understand the memory allocation concept in C very easily. Continue on C – Structure Padding…. Continue on C – Dynamic memory allocation in C….